I don't think the newer ones are quite as big of a deal as the older ones. What year was this one? I've never seen a white Harley. The PSU Limiteds were all white with blue accent. IIRC the first genHD also had a blower on them too. After that they were more appearance packages than anything. yes, and fully loaded around 30 grand, now 30k will get you a stripped down f-150, white paint , steel wheels, and fine gray vinyl to sit on. I found a nicley equipped '97 F-150 in the JY yesterday that had the window sticker sitting in the seat. 5.4, automatic, 4wd supercab, XLT... pretty decent truck. $27k new, hot dang that is CHEEEP! I just went to a inflation calculator thingie online... adjusted for inflation that would be a $42k truck. That is about what I end up with on Ford's "build your truck" thing. well they do exist. This is a newer one though, the one I saw was no question older than the one in the picture, but it shoes that white is an optional color. I have seen a LOT OF HD F-150'S in magazines and the intenet, none until now have been white. I have never seen a newer one white either. This pic is the only one. Saw it again. This time I was able to snap a few pics , but this dude drives fast and I'm in a 20ft box truck that has the speed of a sloth. 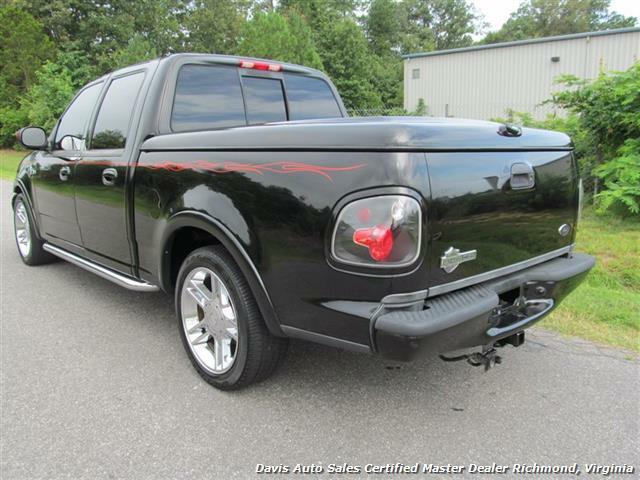 Looks a lot like a 01-03 Harley (wheels, bumper, nerf bars) with a different tailgate badge. That year range (according to an internet search) all had bigger tailgate badges. 2000's all had the regular F-150 badge but it looked like they were only offered as a scab. My guess is it is a repainted Harley. The guy has duals on it so he isn't against modifications as far as paint or playing with badges. It could also have a replacement tailgate.